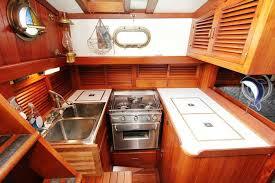 Generally, the galley you have on your boat is the one that comes with it on purchase. But, whether large and spacious (rare) or compact, there are things to keep in mind or do around the galley that can make life on board easier. 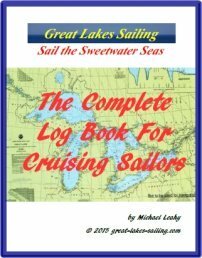 While there are sailors for whom a gourmet meal is a can of warmed up beans washed down with a cold beer, cruising is not camping. A galley, with appropriate thought given to safety, organization and efficiency will add greatly to the pleasure of cruising. All you need to do then is add to some tasty menu items. Know where every fuel, water and electrical line is located. Know where all the connections are. This is important for example if you are testing propane lines for leakage. Know where every shut off is located and ensure they are working. Know the electrical demands that the galley could put on the boat's electrical system and the demands of each appliance. Probably the greatest threat in the galley is fire. As a Coast Guard auxiliarist, I have been in two situations involving boat fires – once responding to a boat fire and once on board a boat that caught fire. Ensure there is a fire extinguisher within easy reach in the galley. Mount it (or them) where they are most easily accessed – you don't want to be rummaging around in a drawer while the flames grow! You only have seconds. Class ABC is probably best as it can be used on the main flammable materials in the galley. The most common type is the dry chemical extinguisher. Make sure it is noted for marine environments. It will give you about 8-12 seconds of discharge time. (Remember PASS: Pull the pin, Aim at the base, Squeeze handle slowly, Sweep from side to side) A dry chemical extinguisher should be inspected monthly (part of a regular boat inspection) and shaken to ensure the powder hasn't begun to cake. Know how to use your model – read the directions. In addition to a fire extinguisher, consider having a fire blanket in the galley. A typical size is about 36”x 36”. Good for small fires such as on a stove top, they can be laid right over the fire to smother it. Unlike a fire extinguisher, it doesn't leave a powdery mess to clean up afterwards. It can also buy you precious extra seconds to deploy a fire extinguisher if it doesn't completely smother the flames. Don't store it in a drawer – speed of access is vital! 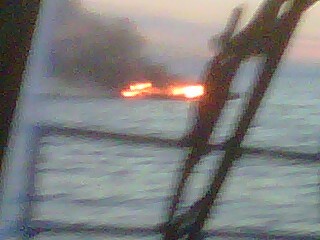 The boat I was on that caught fire went from a wisp of smoke to a cabin full of choking smoke in seconds. One option is to use a couple of velcro straps and secure it to a handy flat surface in the galley. Out of the way yet easy to grab in an emergency. Smoke alarms and CO2 alarms should be installed in the galley and batteries checked/replaced regularly. One constant in every galley is motion. Even in harbour or at anchor, it is always possible for another passing boat to throw a wave that will set yours rocking. Handholds and grab rails are vital to help the cook keep his/her balance. For rougher weather, a restraining strap may be an option to help the cook secure him/herself in heavy weather. There should be pot latches to keep pots secured to the stove and a bar or locking mechanism on the oven and front-opening refrigerator doors. All cupboards and drawers should have latches to keep them closed. Think where the galley fuel will be stored. By far the most popular galley fuel is propane (LNG or Liquified Natural Gas). Propane is inexpensive and available throughout the Great Lakes. It is heavier than air and highly explosive. It burns hot and clean. Because it is heavier than air, any leaks will allow it to settle undetected in the bilges creating an extremely dangerous situation. Therefore, propane should be stored in a self-contained locker outside the cabin. It should be vented overboard above the waterline with the vent at the bottom of the locker. Install a spark-proof sensor in the locker to detect any fumes. If your stove does not have thermocoupled valves to control the flow of gas to the stove, it is vital to double-check that all valves are completely shut off. Otherwise, gas will continue to seep out – an explosion just waiting to happen the next time the cook ignites the burners. Thermocouple-controled valves positively shut off the flow of propane as soon as the flame is extinguished. Fiddles or raised rails on counter and table edges will keep items on the counter top when the boat unexpectedly heels. If lighting is insufficient, mount a few LED lights in strategic locations. The batteries will last for months. Have one red light for use at night. Abraham Lincoln once said “If I had 60 minutes to chop down a tree, I'd spend 59 minutes sharpening my axe.” What he meant was that planning is vital to any project or task. 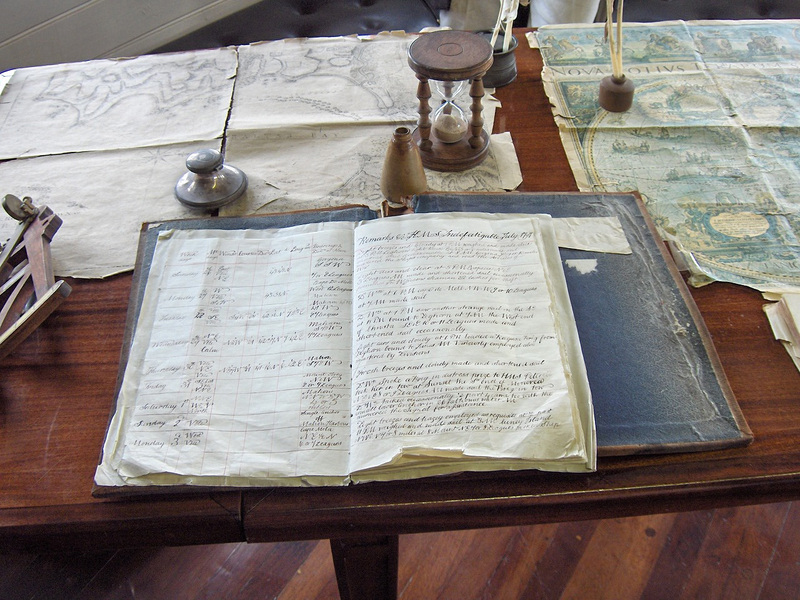 Use lists –keep inventories of cooking utensils, pots, etc and provisions. Plan ahead. Map out your storage space. Have a place for everything. If you are going to cruise for a month, that's 93 meals. Plan them out. 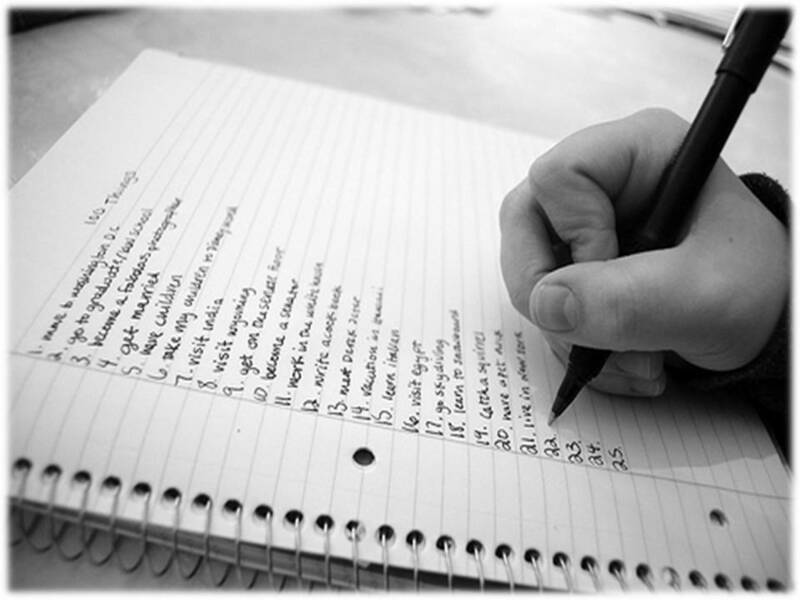 From the meal plan, you can develop a recipe list and subsequently a provisioning list. By working from this meal/provisioning plan, you can monitor your supplies, re-provisioning as needed. On the Great Lakes, you are never far from re-provisioning opportunities. Each port review will identify where you can get groceries. Store cooking utensils and crockery where it is safe, out of the way and secure. Use nesting pots. A drying rack in a double sink can make clean up much easier. A cutting board can be made to fit over a sink or over the burners of a stove. A boat can carry far more than people on board. It is a terrific environment for bugs large and small. And remember, some will come right from the store too. Avoid bringing any cardboard boxes on board as they can and do harbour bugs. That means any cardboard at all – including boxed food items - should be emptied into plastic containers immediately with the box never leaving your hands – seriously (Are you really sure there are no bugs in that pasta or flour? Want to bet an infestation on that?). Toss the cardboard onto the dock, not the cockpit afterwards. Wash fruit and vegetables immediately in a solution of 1 tablespoon/15 ml of bleach per gallon/4 l of water. Rinse afterwards. Put a bay leaf into any (double-bagged) bags of flour or muffin/cake mixes to deter weevils. Along with ant traps, put a whole clove or a cotton ball moistened with oil of cloves in food lockers to repel ants. (Oil of cloves should be in every first aid kit as well to treat toothaches). Sweet liquids such as maple syrup or honey should be double bagged in ziplock bags – less mess from drips and they won't attract ants. Clean up every spill immediately. Use plastic bins of various sizes, clearly labelled. 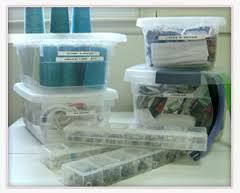 They can safely store dishes, cutlery and your food stuffs. Before storing cans away, label the contents with a waterproof marker. Labels have a habit of coming off and this will eliminate 'mystery meals'. Some people dislike drinking water directly from the fresh-water holding tanks either because of possible taste issues or questions of purity. But, bottled water can take up a lot of space. A simple water filter inserted into the water line can not only relieve concerns but also free up storage space. 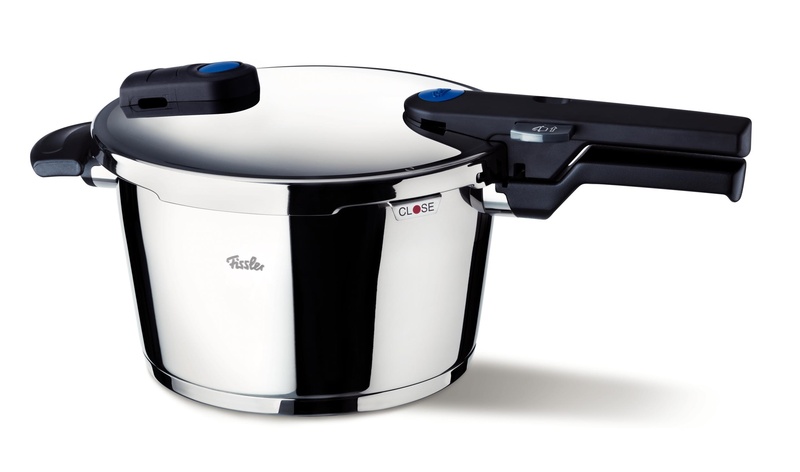 One utensil that can slash your cooking fuel consumption and cooking time is a pressure cooker. Raising the pressure on boiling water will enable it to get hotter much faster using a fraction of the fuel. For example, the typical high setting on a pressure cooker raises the boiling temperature from 212°F/100°C to 250°F/112°C. Doesn't sound like much? A pot roast that could take 3 hours in the oven would be done in 30 minutes using about 80-85% less fuel. Modern pressure cookers are safe. They are widely used in many other parts of the world. Make sure you read the instructions and cooking directions – they cook fast and you can't just lift the lid to check on how its coming along! But, they can save a huge amount of time, reduce fuel consumption and reduce the amount of heat in the galley. And, if you need a large pot for something else, it easily doubles for that. Without a doubt, there are many more ideas that readers will have, based on their own experiences. I would love to hear them and add them to this article. If you have any. Please use the form below to share them. Have A Tasty Recipe To Share? Do you have a favourite recipe to share? Have a good story to go along with it? Why not share it!